Moycullen U13 girls basketball team won bronze in the All Ireland Community Games finals in Athlone at the weekend. 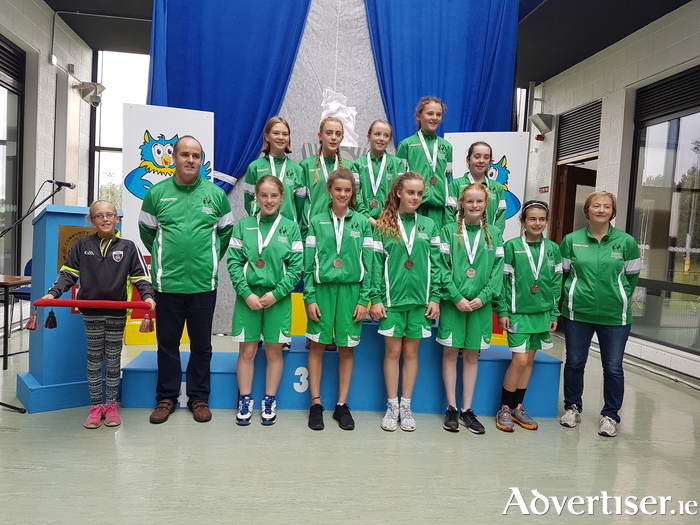 Having being crowned Connacht champions after a competitive provincial campaign, which included victories over Oughterard, Oranmore Maree, Bunnanadden of Sligo, Ballina of Mayo, and Boyle of Roscommon, they went to Athlone with high expectations. However, they came up short in a competitive section, finishing third behind a strong team from Tullamore, and winners Castleisland. Pictured Back row, Jane Roche, Naoise O Donnell, Eimear Burke, Eva Hackett, Laoise Curtin. Front row, Lucy Hynes (captain ), Leah Ruane, Mikaela Devaney, Ruth O'Sullivan, and Caoimhe O'Sullivan, pictured with managers Barry O'Sullivan and Nuala Burke, and medal bearer, Mai Roche.